Skeleton - bone, cartilage, webbed education in the body of animals and humans that perform support and protective functions. 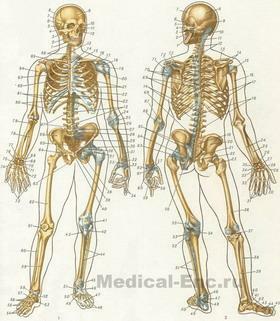 There are external and internal skeleton. External skeleton occurs in the process of evolution in invertebrates (such as the shells of cancers and oyster shells). For humans and other vertebrates characterized by the presence of internal skeleton. Lifestyle, environment and other factors of evolution led to the peculiarities of the formation of the skeleton different vertebrates. The skeleton can be built from organic substances (chitin, horn, cartilage), inorganic (silica, lime) and from a combination of those and other (bone). Bone skeleton consists of separate bones, connected mostly movably with each other and forming a system of levers (table human Skeleton). Together with joints, ligaments, cartilage, etc. he is passive part of the musculoskeletal system. The skeletal support function when standing and moving the body and its parts in space is carried out jointly with the action attached to it the so-called skeletal muscles. A separate part of the skeleton do not only support, but also the protective function of the brain, the skull (see) is a protection for the brain, chest (see) - for thoracic cavity organs, spine (see) to the spinal cord and other Skeleton develops from mesenchyme (see). Most of the bones goes through three stages of development: webbed, cartilage and bone. In the process of development of the skeleton in place cartilage and webbed (connective) tissue appear the bone area (point of ossification). The process of replacing the cartilaginous bases bone ends only 22-25 age, when the growth and formation of the skeleton. The skeleton of an adult includes 207 bones, which, however, can vary. Each bone has a specific shape, size and position in the body. The main fabric, part of the bone is the bone tissue (see). A bone as the body has a bone marrow (see), the periosteum (see), articular cartilage and equipped vessels and nerves. The form of the bone can be long, short, flat, and mixed. In the skeleton distinguish skeleton head - skull; the skeleton of a body - the spine and chest, the skeleton of the shoulder girdle and free the upper extremities, a skeleton of the pelvic girdle and free of the lower extremities. The skeleton has sexual, racial, typical (depending on the Constitution) and individual (dimensions, proportions and other) features. The skeleton of a woman, unlike a skeleton of a man, was founded more subtle and light the bones; characterized by sharply great curve of the lumbar spine, short wide rump, low, wide hips, long and narrow chest, wider and rounded skull. Place of attachment of the muscles to the bones less expressed than in the skeleton of a man. Skeletons of humans and animals, specially treated, on natural bundles or wired and mounted, are an important visual AIDS in medical schools in the study of morphology. Soft skeleton vertebrates and man is connective tissue supporting structures. It includes fibre and fascia.